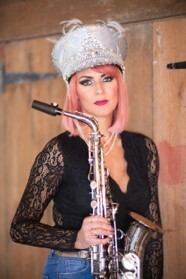 Live Music from Sister Sax Entertainment essex, from Weddings to coroporate functions, discos & parties. Pop, Jazz & swing. Many functions usually include a sit down meal or maybe a champagne reception, so Kay will provide all the background music to suit. This creates a relaxed atmosphere and blends in perfectly with Kay's specially selected Saxophone and Big Band Music classics. Kay will provide an evening of party entertainment, to keep everyone on the dance floor! Our endless library of music covers all decades so all ages and tastes are catered for. Between the booking and the event date we will be in contact with you planning any specific songs you require, for example, the first dance. So you can relax in the knowledge that all of your requests and requirements will be met. Kay also has her own full lighting equipment and PA sound system, which is more than adequate for larger venues so there is no need to hire a seperate DJ. Most of our customers leave the choice of music for their occasion in the capable hands of Sister Sax. Even so, Kay still likes to make sure everyone is happy, so she will always email you a complete list of songs so that you can select which ones you prefer. Please see below for a selection of music Sister Sax plays.